While Antti has been busy at the boat, I have made some purchases. For this season, we are trying to upgrade the interiors and the storage system like we have blogged before. So now finally, I went shopping and made some decisions! Since the new curtains will be natural white, I decided to get stuff that blends blue, turquoise and natural white. As you might remember from my interior posts last year, we had quite a lot of turquoise stuff so we will now need a bit more white to make a the interior look and feel good. First of all, we bought this one storage box that shall be a new home for clothes so that we need not have that many bags onboard. Additionally, I finally chose to buy the striped pillow by Gant (that was listed as the first one earlier) and one additional blue striped pillow by Casa Stockmann. 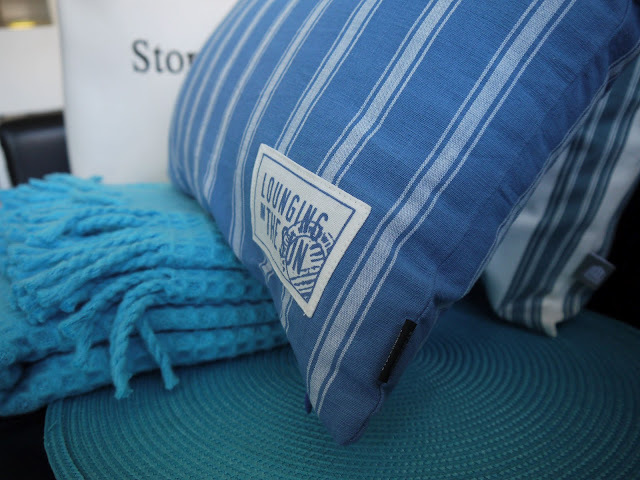 The turquoise blanket is also by Casa Stockmann, as are the blue and white striped napkins.